When managing a complex (or even simple) project with multiple people and lots of moving parts make sure you communicate clearly. A great way to improve communication is to ask your team members to repeat back to you what you just said, to make sure that everyone is on the same page. Use the MaxCon project management software that keeps track of all communications and creates a historical database so accountability and customer service is improved. This strategy also makes it easier to create accountability and hold people responsible for doing a good job. There’s nothing worse than a project manager who over promises, then fails to deliver. In project management your word is your bond. If you promise to do something, enter the information in on the customer file in your MaxCon project management software and cross it off when you are finished. There’s nothing more annoying for a customer than for a salesperson to promise the world and the installation team to drop the ball on the follow through. Protect your image and brand by always following through with 100% of your promises. A good way to make sure your project runs smoothly is to keep good records in the MaxCon project management software. From scheduled jobs, to material orders, and crew time sheets, it’s important to keep track of what’s happening on your team. If a customer makes a special request, or the job requires a change order, make sure it’s entered into MaxCon Pro and everyone agrees. That way, when the job is finished there will be no discrepancies between the work that was contracted and the final product. Keeping good records also makes good business, financial and legal sense. By keeping exact records your critical data is available when you need it most. 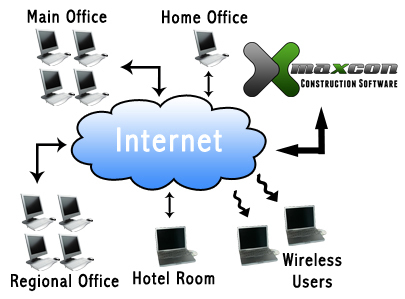 MaxCon Software was designed to help contractors streamline and organize project management. The maximum revenue of a company is not defined by the number of jobs a company can sell but the number of jobs a company can do. Not only does MaxCon help you stay organized and keep your whole team on the same page, but with anytime, anywhere access, your data is always right at your finger tips when you need it most. From storing and organizing documents, files and photos, to managing your customer data, using MaxCon helps specialty contractors maximize production while keeping everything organized and your team on the same page.